Clearly, the geniuses behind this piece of facial recognition software aren’t all that geniusey. 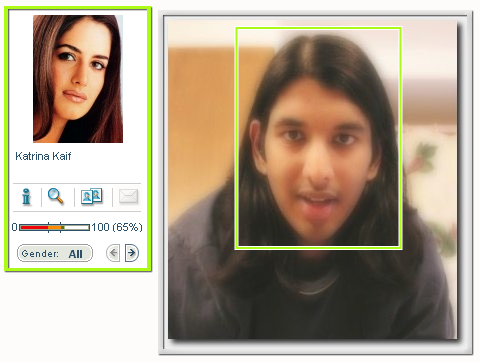 The deal is you submit a picture, and it figures out which celebrity it most closely resembles. But it’s OK, because the software is only in beta. This is a printer-friendly version of the journal entry “Humourous interlude” from actuality.log. Visit https://emphaticallystatic.org/earlier/humourous-interlude/ to read the original entry and follow any responses to it. And Katrina Kaif is Salman Khan’s girlfriend, I hear.More heehee. So basically, what you two are saying is that not only did I get a female, but I got some pseudo-celebrity whose only claim to fame is that she dates this guy who enjoys killing poor defenseless animals and driving drunk over people on the sidewalk? Just great. And I thought this system thinking I had her god-awful chin (kinda like Affleck) was the biggest of my problems. haha…be glad mister pundit, that u didnt have a pony tail in the pic…you might have got arindam chaudhury in the result! anonymiss: No one is saying Mr. Affleck isn’t cute :D. We just choose to make fun of his chin from time to time. niyati: At least then it’d have gotten my gender right! But then again, I’d rather be a somewhat-hot woman than some guy who looks like he went to business school.